With the Veltins-Arena roof fixed firmly shut to keep out the bitterly cold March weather, Schalke vs Hertha was played out to a capacity crowd. In a fast-flowing game, the hosts just about did enough to grab all three points. Hertha for their part will be bitterly disappointed they are unable to travel back to the capital with a share of the spoils. As Guido Burgstaller looked on from the stands, Schalke struggled in front of goal for the vast part of this fixture. The hosts had three good opportunities to open the scoring inside the first seven minutes, had the Austrian been available for selection he would have almost certainly capitalised on the laid-back approach to defending Hertha displayed. Marko Pjaca was the first to test Rune Jarstein in the Hertha goal, the Norwegian called into action from the referee’s first whistle. He wasn’t to be the only one – Ralf Fährmann at the opposite end of the pitch was about to be tested to the same depth as his Hertha goalkeeping counterpart. The 29-year-old first tipped the ball clear after a dangerous shot by Marvin Plattenhardt. From the resulting corner, the Schalke ‘keeper was required to make another last-ditch save, the fixture was beginning to be defined by attack after attack. 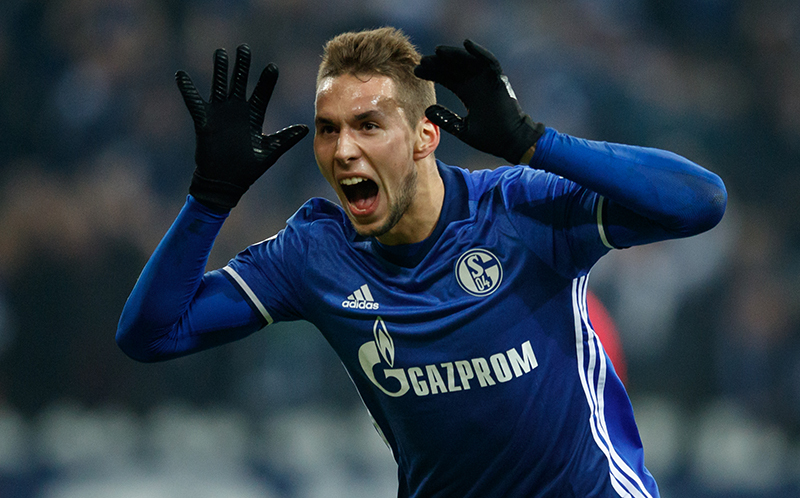 On 36 minutes Schalke broke the deadlock – Caligiuri broke down the right and teased the ball across the box, Marko Pjaca was on hand at the far post to tap the ball into an empty net. Hertha may have felt it was against the run of play but goals win games and Schalke had found the opener. As the halftime beak loomed Nabil Bentaleb went close with a snap-shot from the edge of the area. Anywhere else and it was a goal, but the midfielder fired it straight at Jarstein. Hertha came out for the second half with an intent to score, by rights they should have – and some. Salomon Kalou, Niklas Stark and Valentino Lazaro all went excruciatingly close to equalising for Hertha. Four chances inside the opening 10 minutes of the second half but all to no avail, the Berliners just couldn’t find a way past Fährmann. 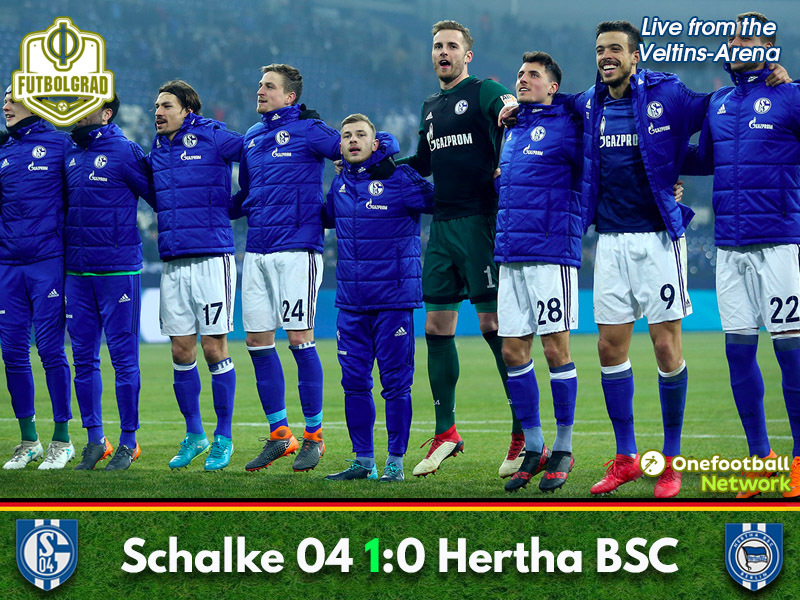 With 15 minutes left the Veltins held its breath – Kalou made a nuisance of himself inside the Schalke box, the forward unleashed a shot from close range but somehow Matija Nastasic recovered to make a sublime block. Hertha were knocking on the door but couldn’t find a way in. As the fourth official held up the board to signal three minutes of added time the hosts were hanging on – but hang on they did. Schalke went second, putting the pressure back on local rivals Dortmund as they prepared to face Leipzig at the Red Bull Arena. The Schalke forward was a danger from the very start of the fixture – almost breaking the deadlock on seven minutes. Working the space around him to excellent effect on 36 minutes he wasn’t to be denied his goal. Giving the slip to his Hertha minders the Croatian was on the spot to slot home the winning goal at the far post. In a fixture that ebbed and flowed it was a surprise that the score-line only ended with one goal. Both sides had an abundance of chances to tuck away significantly more than the final score suggests. Whilst Schalke managed to make one of theirs count it will be Hertha that will rue a number of spurned chances as they go home with no points to show for their hard work.